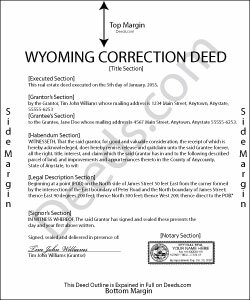 Use the correction deed to correct an error in a previously recorded deed of conveyance, such as a warranty or quitclaim deed, in Wyoming. Correcting an error in a recorded deed helps prevent problems that might arise when the current owner tries to sell the property. The best method for correction is to prepare and record a new document, often called a corrective or correction deed. This document does not convey title; instead, it confirms the prior conveyance of the property. Apart from supplying the correct information, the new deed must give the reason for the correction by identifying the error. It also must reference the prior deed by title, date, and recording number. The original grantor signs the corrective deed, which confirms the property transfer to the grantee. Generally, deeds of correction are used to address minor omissions and errors in a recorded document, such as typos, accidentally omitted suffixes or middle initials of names. When correcting the legal description, both grantor and grantee should sign the corrective instrument to avoid doubt regarding any portions of the conveyed property. For certain changes, however, a correction deed cannot be used. Adding or removing a grantee, for example, or making material changes to the legal description, especially deleting a portion of the originally transferred property, may all require a new deed of conveyance, instead of a correction deed. When in doubt about the gravity of an error and whether a corrective deed is the appropriate vehicle to address it, consult a lawyer. Deb D. said: Excellent website - easy to use, and found exactly the form I needed right away. Highly recommend. Rajashree S. said: Deed was easy to download and complete. Will use again if needed.